The Lothians and Fife can boast two ancient fraternities that seem to have been forerunners for 'home-grown' affiliated friendly societies of the Ancient Order of Free Gardeners and sister organisations. The oldest record of the Fraternity of Gardeners of East Lothian was written on 16 August 1676. Forty years later the records of the Society of Gardeners in and about Dunfermline begin. Both sets of records survive almost complete - and both hint that the societies might be older. The rules of both societies show that they were concerned with the profession of gardening in their own areas. The members ruled on their own behaviour as gardeners. They looked after themselves by paying benefits and annuities to those in need. Both societies allowed non-gardeners (amateurs) to join - but they paid more. Over time, new members joined both societies for the benefits they provided - or the preferential loans they could get from the societies 'boxes' - their treasuries or reserves. Gardening became less important than mutual aid. 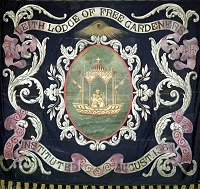 More lodges of Free Gardeners were founded all over the Lothians. By the middle of the nineteenth century there were around 50 lodges in the region. The names of the newer foundations were usually embellished with a descriptive term or a dedication, e.g., Penicuik Thistle Lodge, Lasswade St Paul's Lodge, Whitburn Olive Lodge, Dunbar Black Agnes Lodge. In Haddington the society bought a tenement as their base. It is still the Gardeners Arms public house. They had flower and produce shows and sometimes paraded through the town dressed in aprons and wearing sashes. They were led by the town piper and a costumed 'Jock in the Green', who carried a bower of flowers to represent the Garden of Eden. They bought silver badges for their officers and commissioned jugs to be used at their regular dinners. The society survived until 22 February 1953 when the last 23 members agreed to disband. 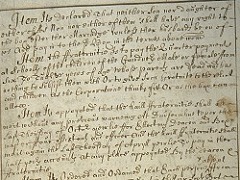 Their minute books went to the National Archives of Scotland until there was a proper home in Haddington. 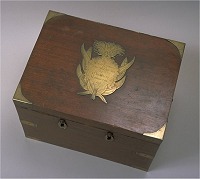 The treasures went to the East Lothian Antiquarian Society for preservation; trophies were returned to the donor families or presented to individuals. In Dunfermline the society appears to have fallen on hard times in the first half of the 19th century. It re-emerged with two separate sections - a benefit society that paid an annual pension and a horticultural section that organised flower shows. Its wealth came from land that it owned and leased out. It had enough to do away with subscriptions and just asked 'entry-money' - a joining fee. Relatives of existing members paid a lot less than others. This worked well for most of the 19th century, but inflation began to reduce the value of the annuity in the 20th. The society lingered until the 1990s, when it was costing more in administration than could be paid out. Although now extinct, the free gardeners were once a familiar sight in towns all across the Lothians and Fife for over three centuries. In that time their resources, once devoted to raising the standards of the profession of horticulture, were essential to many, providing support and benefit to thousands. See the Free Gardeners section for more detail on Gardener societies.